Bann Wheelers Cycle Club annual "Causeway Cycle Challenge" will be taking place on Sunday 26 July 2015 from Coleraine Rugby Club. The sportive has two routes in 2015 with 40 mile and 65 mile options, taking in the picturesque Lower Bann and stunning Causeway Coast. The 65 route also takes in the world famous Dark Hedges. On Sunday 5th July Foye CC will be promoting a fund raising cycle, the Foyle Hospice ladies cycle. The event is being run to foster the two wheeled sport among women and to raise much needed funds for a very worthy local charity. Doochary Charity Cycle Sunday 28th June. Four Masters Cycling Club in conjunction with Omalleyscanlon Insurance Brokers are running their annual Doochary Charity cycle on Sunday 28th June. 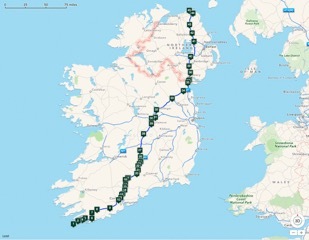 This is a 46 mile route taking in some of the most scenic areas on Donegal cycling along the back to Glenveagh National Park. This year the route will go in the opposite direction, finishing with the Meenaroy climb. On Line Registration is now open for the Billy Kerr Cycling Sportive. North Down CC are promoting the Bangor Coastl Challenge this Sunday which takes in a scenic coastal route of 100km around the Ards Peninsula which has few inclines and takes a break in Portaferry for lunch. So whether you are a serious cyclist or a novice wanting to cycle the distance for the first time the NDCC Bangor Coastal Challenge is the event for you! On the 26th June 1955 Isabel Woods set out on a 386 mile cycle from ‘Mizen Head’ in Cork to ‘Fair Head’ in Antrim, hoping to set the record for this “Irish End to End”. 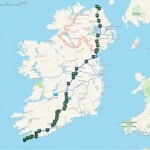 She completed the journey in 23 hours and 3 minutes. Isabel held this record for 52 years until in 2007 when it was broken by Rose Leigh Albeit, by an 18 mile shorter course.